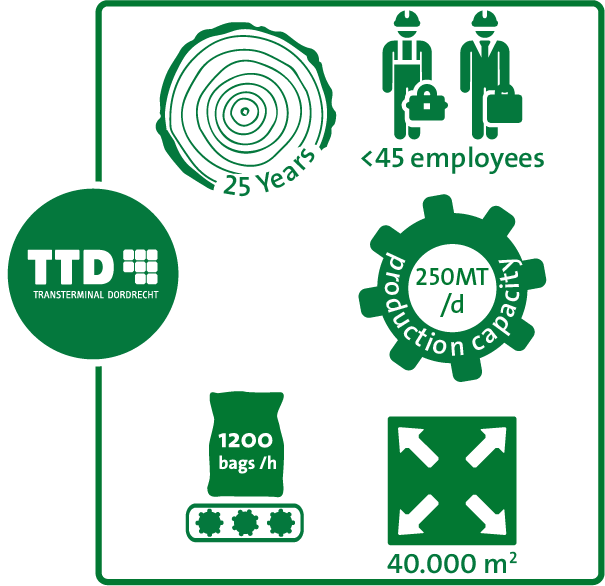 TTD combines capacity and flexibility which make this production site unique in its kind in Europe. The entire blending and packaging facility is acclimatized. Not only all conveyors are covered and conditioned, but also the floors are equipped with floor-heating. This ensures a dry product with limited caking sensitivity. High quality guaranteed. This production facility has over 25 years’ experience and is certified (ISO 9001:2008). It is conveniently located near the port of Rotterdam and our business does not stop at the European borders: we deliver WS NPKs to more than 90 countries all over the world. 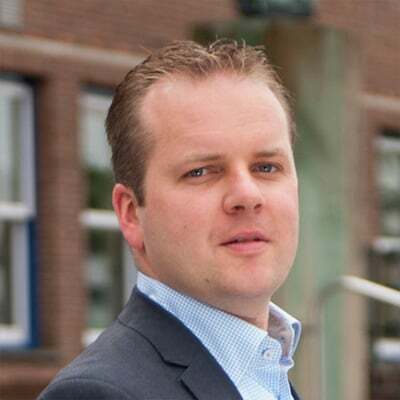 "Producing the orders of Van Iperen is always a nice challenge. We have to combine high capacity and flexibility without compromising quality!" We developed an innovative coloring concept. 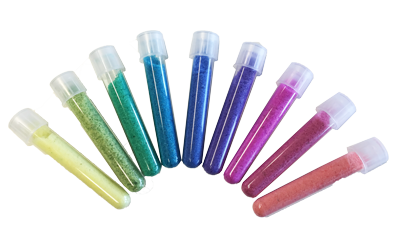 The result is an intense and consistent coloring of the products as well as the solutions. You can choose from a wide range of colors which allows you to stand out in the market. Our approach: Pick your own color! We can pack an extended range of different types of bags, from 1 up to 25 kg. Our facility can keep up with a capacity of 1200 bags per hour. Special attention is paid to the strength of the bag and the seal for which our quality controller has implemented a bag drop test. 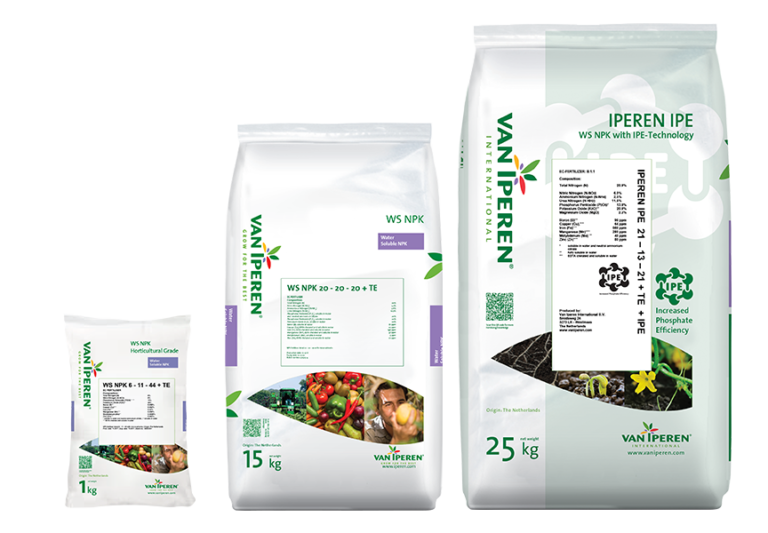 To enable you to add your identity and product specific information on the Van Iperen bags, we implemented a dedicated printing technology without using labels. Tracking and tracing is guaranteed by a barcode printed on the bag. The printing is done while packing the product, which increases the flexibility. Each bag is weighted and cleaned after packing before palletization and shipment. 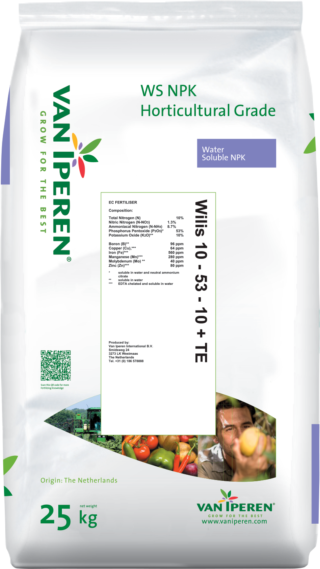 Van Iperen Wilis | 10 - 53 - 10 + TE is a pure WS NPK with a high level of Phosphate combined with EDTA chelated micronutrients. Our product has a limited caking sensitivity and is recommended during root and shoot development. The high level of Phosphate in our formula increases cell division and development of new plant tissue. The presence of micronutrients supports general plant metabolism. Van Iperen El Misti | 6 - 11 - 44 + TE is a pure WS NPK with a high level of Potassium combined with EDTA chelated micronutrients. Our product has a limited caking sensitivity and is recommended during fruit or tuber development, especially during periods of drought. The high level of Potassium in our formula improves the cell pressure and regulates the functioning of stomata. The presence of micronutrients supports general plant metabolism. Van Iperen Ubinas | 20 - 20 - 20 + TE is a pure and balanced WS NPK combined with EDTA chelated Micronutrients. Our product has a limited caking sensitivity and is recommended at different phenological stages. The high level of Nitrogen, Phosphate and Potassium in our formula improves cell division, cell elongation and cell pressure. The presence of Micronutrients supports general plant metabolism.